Can a Military Coup Ever Succeed Again in Nigeria? Before getting into my latest site topic, please note that several sections of the site have been updated recently. The inaugural speeches of Babangida and Abacha have been added to the speeches section, as have the broadcasts by Phillip Effiong and Gowon’s “the dawn of national reconciliation” speeches which marked the end of the civil war. In the Biafra Videos section, I have uploaded 18 separate videos from the NTA’s documentary series on the civil war which features great interiviews with the protagonists like Gowon, Ojukwu, Haruna, Joe Achuzia, Shuwa, Innih, MD Yusuf, Ben Ochei, Conrad Nwawo and David Ejoor. Now, onto my latest topic….. The military was so politically powerful at 1999 that the incumbent service chiefs of the army, navy and air force (Lt-General Ishaya Bamaiyi, Vice-Admiral Jubril Ayinla and Air Marshal Nsikak Eduok respectively) initially refused to retire when the army handed over to a democratic government in May 1999. Only after weeks of national debate were they persuaded to stand down. Within one month of the restoration of democracy in 1999, the government drew up a list of all armed forces officers that had served in military governments for 6 months or more. All such officers (numbering over 100) were compulsorily retired. The retirements swept out a number of immensely powerful and wealthy officers who could have been sources of future political discontent and coup plots. The retired political officers included Major-General Patrick Aziza (who chaired the ‘coup’ tribunal that convicted Obasanjo and Shehu Musa Yar’Adua in 1995), Air Vice Marshal Idi Musa (accused of framing up Diya and co during the 1999 coup plot), former Abacha regime members Major-Generals Bashir Magashi, Abdullahi Mukhtar and Chris Garuba (former Commandant of the National War College), the former commander of the Brigade of Guards Brigadier Yakubu Muazu, the former Military Governor of Rivers State Colonel Dauda Musa Komo (who was instrumental in events leading up to the arrest and detention of Ken Saro-Wiwa), Major General John Mark Inienger (former ECOMOG commander), Air Vice Marshal Idi Musa (former head of the Defence Intelligence Agency who was accused by some of being one of those that framed Diya, Adisa and Olanrewaju in the 1997 coup plot against Abacha) and the popular and powerful former Military Governor of Lagos Brigadier Mohammed Marwa. The 9 year period from 1999 till the present is the longest period of time in Nigeria’s history without a military coup. It is no coincidence that a coup failed to occur in the absence of the retired political officers. So has the military permanently weaned itself of its coup plotting habit? Major Hamza al-Mustapha was charged with a coup plot (which included an alleged attempt to assasinate President Obasanjo by firing a missile at his helicopter). There were very strong rumours of a coup during the early days of the Obasanjo government too. The then Chief of Army Staff Lt-Gen Victor Malu publicly went so far as to tell troops to summarily execute any soldier who went on air to make a “my fellow countrymen….” announcement. He said they should be shot “before they put the microphone down”. The fact that Malu felt the need to issue such a strong public warning convinced many that a coup plot had been detected. The continual retirement and redeployment of military officers has ensured that they find it difficult to build critical support networks and political bases that are required for coups. Coups have succeeded in the past because of (a) the support of the civil populace (b) the lack of pro-democracy/human rights groups (c) the indifference of the international community. The June 12 crisis radically changed the Nigerian populace’s relationship with the military and a military coup in modern Nigeria would be met with massive civil opposition and sanctions from the international community. It would take civilian misrule of cataclysmic proportions for Nigerians to tolerate military rule ever again. Firstly, welcome back. Nice article, and thanks for the other updated links. Now to the ‘meat’ of the post. Aside from the constant movement of politicised officers, another reason that a coup would be difficult nowadays (though not impossible) is the fact that Ibrahim Babangida and Sani Abacha, (themselves professional coup plotters) made the move from Dodan Barracks to Aso Rock. With the entire Guards Brigade sitting just behind Aso Rock, it would take a lot to successfully complete a coup out there, and this isn’t including the fact that Aso Rock itself is a great defensive position. Again another thing that has changed from the heyday of coup plotting is the proliferation of radio stations in so many parts of the country. Back in the day when the only radio stations (which were few in number anyway) were all government controlled, they were always a strategic target because as the executors of the first coup realised (Ben Gbulie for ref), information is power. Gideon Orkar’s coup (or its failure) showed the immense value of having access to control of information. I want to reply this with this e-mail address. Military coups can and will happen again in Nigeria if care is not taken. Just wait till Yar’Adua finishes his eight years and you will marvel. Say Who! pls i just guess the so called BG are not that Elite! and the Army is not so professional! Aso Rock can be Smoke! Came across this again after a while and just now there was yet another coup, guess it’ll take an extremely long time beofre there is ever proper rule. Azo, the coup was in NIGER, not Nigeria. Max: since the BBC news item at http://news.bbc.co.uk/2/hi/africa/356304.stm referenced Malu as new COAS, my question should have addressed Malu, so here I rephrase: “Was the new COAS appointed hours after Obasanjo was sworn in or weeks after?” Could it perhaps have been that Malu was made new COAS hours after Obasanjo was sworn in, while the national debate in your post concerned Ayinla and Eduok? Fjord, the debate took place weeks BEFORE OBJ was sworn in. There was a debate as to whether he would inherit Gen Abubakar’s service chiefs (Bamaiyi, Eduok, Ayinla). OBJ appointed his own service chiefs who took office when he became President. Hope that helps. ‘Misrule of catalysmic proportions’ like we’re experiencing of a clueless man(president) right now! The current spate of violence and insecurity if not curtailed ll be a welcome excuse for the return of the military. If this is the price for democracy then I think Nigerians will rather pay with the return of the soldiers. 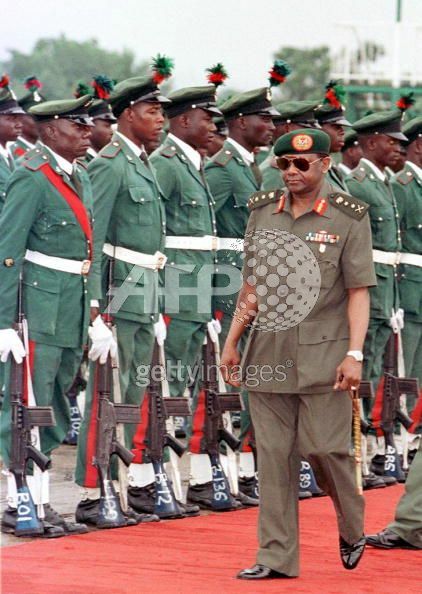 Babangida knowingly or unknowingly put an end to planning coups in Nigeria. My submission: Violent coups have never succeeded in Nigeria, the Majors of Jan ’66, Dimka in ’75 and Okar in ’90. I know someone would mention july ’66, that was more a mutiny than a coup. successful coups have all been palace coups with the knowledge of the Guards brigade or connivance of men in the brigade to compromise the C-in-C’s safety. IBB changed this as the Brigade of guards is responsible for perimeter security and close/personal security of the president now belongs to the SSS/DSS, a plot thus is no longer the sole purview of the army, any plot must include the DSS and I personally don’t think any right thinking officer of the armed forces would approach an operative of the DSS whose primary job is gathering intelligence and writing security reports to broach a change of government topic. It’s possible between an infantry and intelligence officer of the army ( even that is considered risky) due to the esprit de corps that exist and is nurtured through either being course mates at the academy, joint training, or postings, so a level of trust has been established. This i honestly believe is the reason we haven’t heard a ” my fellow Nigerians” speech in the last 17 years even when things got so bad at the height of the Boko Haram insurgency. Thanks for the insightful comments Salami. IBB’s security conscious nature certainly changed the dynamics of coup plotting and made it far more difficult and risky. That said he still faced two coups in 1986 and 1990. Even after IBB, there was an alleged (1995) and actual (1997) coup during Abacha’s time, as well as another attempt against OBJ nipped in the bud before it could get off the ground. Other factors include OBJ’s retirement of politicised officers in 1999 who were responsible for many coups going back decades. Also let us not forget that some of the coup experts are now in the government!